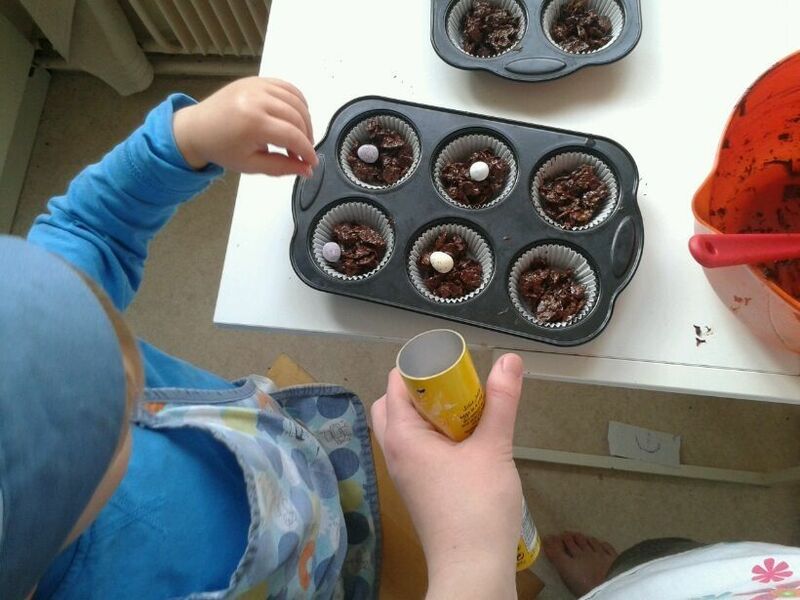 Easter Teaching – it’s not too late! For another idea, hop over to “Resources” and scroll down to the Bloody Easter teaching (alternatively that link should work). We don’t do time-outs with our children. I’m not saying you shouldn’t, just that we don’t. Sometimes you think being quiet is the best course of action – sometimes it is. But if you’re actually punishing someone with the silent treatment, that’s not OK. The main reason that’s not OK, is that God our Father is not like that with us. As his children, trusting in Christ, we always have the ear of the Father. He always hears us, and always speaks to us. He’s never in a mood with us, he never makes us face the wall. He does, in love, discipline us, yes, but when we come humbly to him, ‘Daddy, Daddy I’m sorry,’ we’re never turned away. I want my children to know what God is like, so that is one reason I don’t give them the silent treatment. But let me be clear – my children deserve the silent treatment from God, and so do I. I don’t want them to grow up thinking that God is always listening to them because they’re so lovely and good. I don’t want them thinking that God forgives their wrongs because that’s his job. Maybe that’s how you feel. That’s what the world around us tells us most of the time. If you believe that, please look more carefully at the cross of Christ. For the first time in all eternity, the Father hid his face from the Son and didn’t answer. Jesus had been afraid to go to the cross because he knew that this would happen, and he knew that being cut off from the perfect, loving, life-giving God would be unbearable. The only way for my children to have a perfect relationship with God the Father forever is for them to understand that they deserve no relationship at all. But Jesus took what they deserve on the cross, standing in their place, so that if they believe in him they will never have to say the words, ‘My God, my God, why have you forsaken me?’ They will never hear Jesus say, ‘Away from me, I never knew you.’ (Matt 7:22) They will never have to spend eternity without him. If you don’t believe this – if instead you think that God is kind and good and will accept you, just as you are, then please take the time this Easter to check your facts. Have a read of a gospel, go to a Bible-teaching church and listen, meet up with a Christian friend. God doesn’t just pat you on the head and tell you that your sin doesn’t matter. The truth is much more wonderful, and much more costly (for him) than that. Easter is a time of fantastic news, of Jesus beating death for us and winning us eternal life with God. I find thinking about the cross hard – I often want to skip Good Friday and move straight onto Easter Sunday. But the cross is really where I see how much God loves me. That he was willing to give his perfect Son the silent treatment I deserve, so that I can be his beloved child forever. “19 Therefore, brothers and sisters, since we have confidence to enter the Most Holy Place by the blood of Jesus, 20 by a new and living way opened for us through the curtain, that is, his body, … 22 let us draw near to God with a sincere heart and with the full assurance that faith brings…” from Hebrews 10. The controversial colouring page pictured above is a copy of a page from the book, ‘The Garden, the Curtain and the Cross‘ published by the Good Book Co., which you can read more about on my Good Reads page. A while ago I recommended a book, The Garden, The Curtain & The Cross – you can read about it here. I’m going to use it this year to teach my children about Easter. In case you might find it helpful, here is what I plan to do. It’s not yet tried and tested, but I’ll let you know how it goes! I do hope it’s helpful. Again, I really recommend the book – much better than a load more chocolate for Easter – but if you don’t want to buy it I’m sure you could find corresponding stories in children’s Bibles if you wanted to. Main point:The Best thing about being in the garden was being with God, face to face. What can we see in the garden? Who is in charge of all these things? What was it like for Adam and Eve living in the garden? What was the best thing about being in the garden? Songs: Who made the twinkling stars? My God is so Big. Any baking/craft – talk about how we have made something so it belongs to us. Then share it with someone we love. Main Point: The worst thing about sin is that it means we can’t be with God. What was it like living in the garden with God? Why did they do it? They didn’t want God to be in charge. When we decide we don’t want God to be in charge, what does God call that? Sin. What happened to Adam and Eve next? What was life like for people outside of God’s garden? Song: “God is a holy God” by Emu. What’s wonderful about the temple? Pray: Thank God that even though we sin, he still wants to be with his people. Main Point: By taking our sin on the cross, Jesus has made a way for us to be face to face with God again. The Son had always been face to face with God in heaven, but he came to earth where things are sometimes sad and sometimes bad. Did Jesus ever sin? Pray: Thank God for sending Jesus to die even though he had never sinned, so that we can be face to face with God because our sin has been taken away from us. Main Point: Because the curtain tore in two when Jesus died for our sin, we can be with God face to face. We can know him now and will be with him forever in the new garden city. After Jesus died, what happened to him? Where does Jesus live now? Who has Jesus invited to come and live with him in God’s wonderful place? How has God’s ‘Keep Out’ sign been taken away? Pray: Thank God for all the things we’ve learnt. Thank God that if we trust in Jesus we can be with him forever in the new heaven and new earth, where there will be nothing bad, and no one sad. Ask God to help us keep going, trusting him, until we get there. 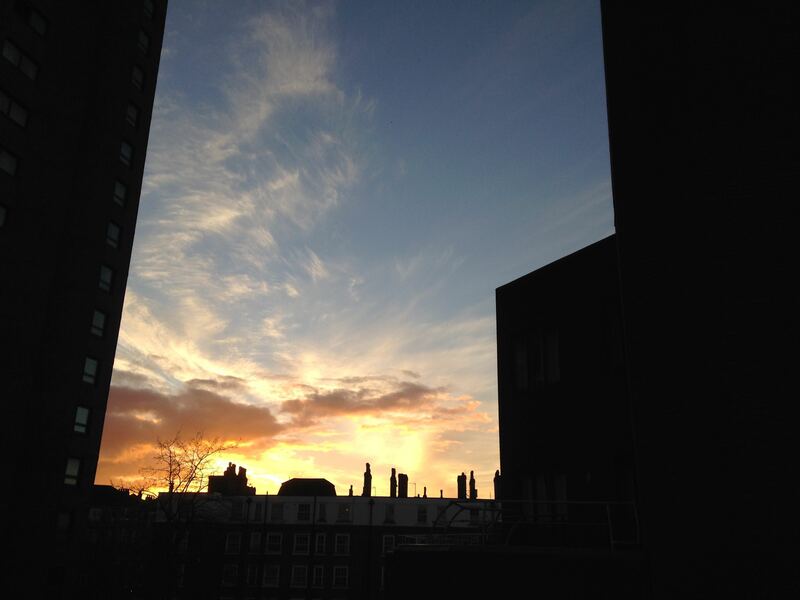 “God is a holy God” – to recap on the week. We can live with God for ever! There will be nothing bad, and no one sad. And it’s all because of Jesus. “Look! God now makes his home with the people. 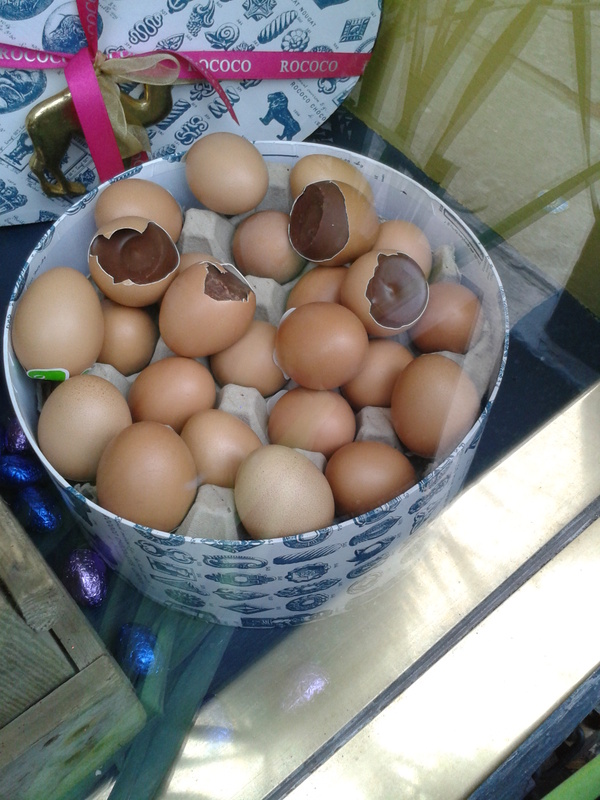 Hello all, it’s Easter soon! I’d like to teach my children about the death and resurrection of Christ this Easter in light of the Old Testament substitutionary sacrifices (wow, big words). So just in case it’s helpful, here are my notes. I do plan to prepare some teaching for Good Friday and Easter Sunday too, but to give you a chance to use it I thought I’d post this now. I hope to do these lessons next week, in the days leading up to Easter weekend. Am praying it will help them to see why Jesus died and why it’s wonderful news for us that he’s our sacrificial Lamb. Let me know if you have any questions about it. Sorry about the formatting. I tried my best! I’m using the Jesus Storybook Bible, but I’m sure you could use another children’s Bible which include the relevant stories. The Present – JSB p. 62 (Abraham and Isaac) Remind them about Abraham, the promise and the son of the promise, Isaac. 3. BUT, Abraham had said God would provide a LAMB. So where is the lamb? Jesus is the Lamb that God provided. Jesus died for our sin so we don’t have to. He died for Abraham’s sin and Isaac’s sin too. We’ll find out more about that later in the week. 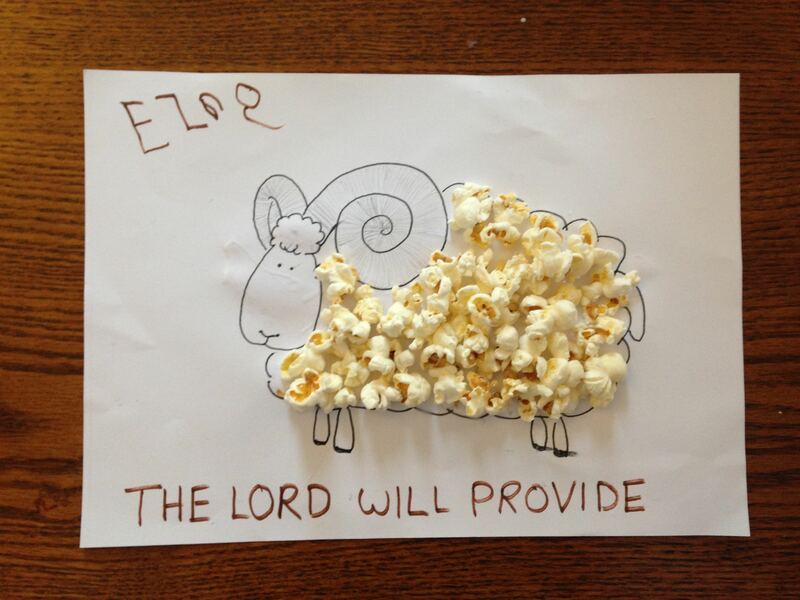 Pray and sing the memory verse.Activity – Popcorn RamsUse picture of ram (I shall ask my husband to copy a basic one from a colouring page online) and write ‘The Lord will provide’ under it. Stick popcorn to the ram’s body (optional! Could just colour it in). God to the Rescue! – JSB P. 84 (The Plagues, Passover and Exodus) We learned last time about Abraham and his son Isaac. Isaac’s grandson was Joseph, and he and his brothers had loads of children so there were a lot of God’s people now. Let’s find out what happened to them. 1. God wanted to rescue his people from Egypt – but did Pharoah want to let them go? 2. God punished Pharoah and the Egyptians by sending lots of plagues – do you remember any of them? Yes! Do you see that God provides something to die instead of his people. They deserve to be punished and die, BUT because they trust God and sacrifice an animal instead, God keeps them safe. Pray and sing memory verse. Make lambs by drawing round their hand on black paper or card. The thumb becomes the head and the four fingers the legs. Stick/draw an eye on! Cotton wool for the body! Paint a pic of a door frame red (see link below) – you could pretend to cut up your lambs first – or have a pre-made sacrificial one to cut up! The Servant King – JSB p. 286. God’s people would celebrate the Passover every year by having a meal together and telling the story. They would eat a lamb and remember how the lamb had died instead of God’s people. In this story, Jesus celebrates the Passover with his disciples.Read story. 3. Did Jesus know that he was about to be killed on the cross? (Yes! )Just as the Passover lamb died, now Jesus was going to die instead of the disciples. They wouldn’t have to kill a lamb and put the blood on their doors – Jesus would be their sacrifice instead. We are like the disciples – we can be saved from death if we trust in the blood of Jesus. Just like the ram was killed instead of Isaac. Just like the lamb was killed instead of the sons in Egypt. Jesus was killed on the cross, instead of you and me. Pray and sing memory verse. These are the lyrics to a brilliant and inspiring rap written by my friend Stephen (aka Carbon). There isn’t really a substitute for hearing it performed, but in the absence of a recording this will have to do. I hope you enjoy it anyway! Happy Easter. Is this God’s king that they call Christ? He walks and he talks – what can they say? You will raise us: share all life and live with him. So death where is your sting? Who can bring a charge against us? Who can say a thing? Who is raised to life, at the Father’s side. As we put our hope in this house that stands all weather. I’ve put my ultimate trust in one man – not just for my life, but for the lives of my children. That man is the God-man, Jesus of Nazareth. I am bringing my children up to put their trust in him, and to do that I have to be sure I trust him myself. Otherwise, it’s too great a risk. At that time of fear and uncertainty, I chose to trust Jesus. And every day, as I teach my children the Bible and bring them up to be soldiers of Christ, I am choosing to trust Jesus. I’m trusting that he is all that he said he is when he walked the earth. But how can I trust him? There’s no greater risk than risking your eternal future, and so how has Jesus earned my trust? On the first day of the week, very early in the morning, the women took the spices they had prepared and went to the tomb. They found the stone rolled away from the tomb, but when they entered, they did not find the body of the Lord Jesus. While they were wondering about this, suddenly two men in clothes that gleamed like lightning stood beside them. In their fright the women bowed down with their faces to the ground, but the men said to them, ‘Why do you look for the living among the dead? He is not here; he has risen! Remember how he told you, while he was still with you in Galilee: “The Son of Man must be delivered over to the hands of sinners, be crucified and on the third day be raised again.”’ Then they remembered his words. Luke 20:1-8. Friends, the tomb was empty.